The great Kinder beer barrel challenge - read all about it! Earlier on this year, we went into the Snake Inn for a beer at the end of a walk. I spotted a 'certificate' on the wall - and was amazed at the content. It alluded to a race - the KINDER BEER BARREL CHALLENGE. I looked at it - and was AMAZED that the time to cross Kinder (4.5 miles, but over HORRENDOUS terrain) was under an HOUR! NO! - SURELY not - it MUST be some mistake? It wasn't! There was a legendary team by the poncey name of 'Gladioli' that was a collection of crack fell runners, and to date, they have NEVER been beaten! The name, I am told, came by way of a local lass who was in 'Gladiators' (the TV program) and who was something to do with a team being entered. That team never materialised, BUT this other team decided to name themselves 'Gladioli' as a sort of antithesis to the Gladiators. Now - the name has stuck - and they are ANYTHING but 'poncey'! Last Saturday, I decided to go and see what all the fuss was about and here, for your edification, are the pictures to show what it IS all about. In 1999, the unthinkable happened in the isolated village of Edale in the heart of the Peak District. The popular Nags Head inn ran out of ale. Fortified by a pint or three, the locals (NB - the instigator was named Trev Townsend) came up with numerous ways of rectifying the situation (none of which involved relocating to one of the other nearby pubs!). The most popular solution was for a group to walk over the high moorland of Kinder Scout to the Snake Pass Inn to bring back a full 44kg barrel. Although there is arguably some sense in this – it is only 4.5 miles over the top as the crow flies, as opposed to 17.5 miles around by road – their addled brains had overlooked the strenuous 1,000ft climbs and precipitous descents at each end and the featureless peat bogs in the middle! 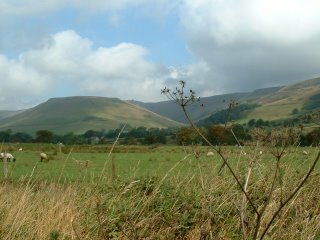 Here we go - this is the view I got of Kinder Scout on a warm, balmy morning. PERFECT conditions, you would think, to drag/shove/haul/push a full barrel over rough moorland. I ask you - are there ANY conditions you could deem 'perfect' for such an arduous task??? 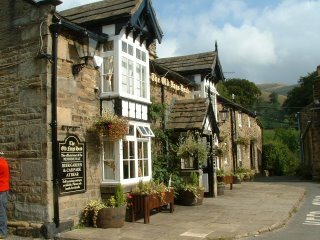 Here's the Nags Head at Edale on that very morning. No-one here yet, as all the action was taking place at the Snake Inn, 4.5 miles away across the boggy moorland to our North. One of the Gladioli team, I am told, was here at the crack of dawn to walk over the moors BEFORE the race, to 'warm the old legs up' before the race began!!!! Some people are just TOO masochistic for their own good! 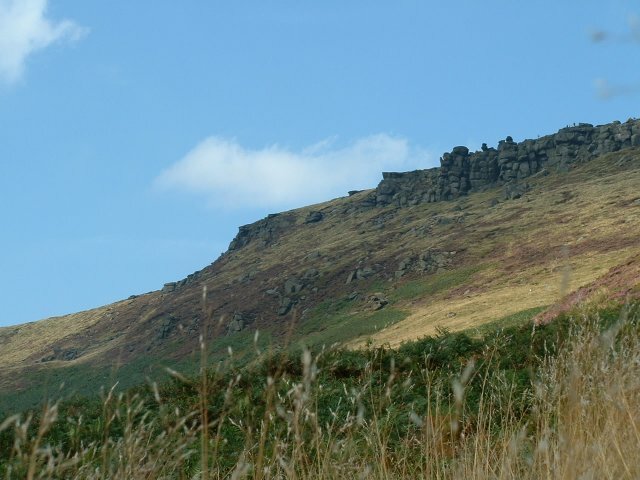 Here's a view up to Grindsbrook (pronounced GRIND - rhymes with HIND - as opposed to GRIND - rhymes with WIND). The spectators are few, but hardy! 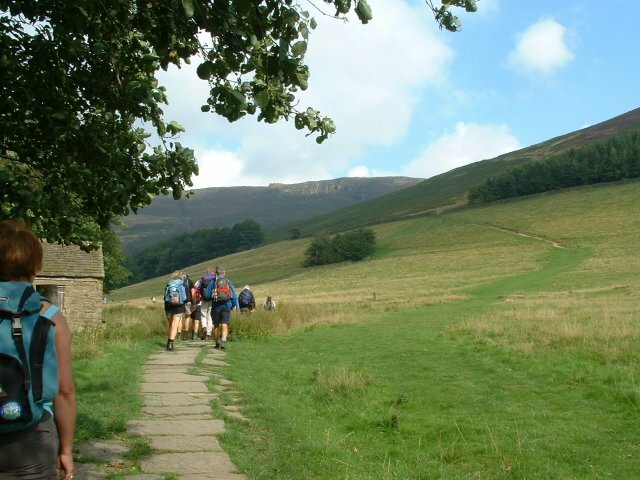 This is Kinder Scout, and today it looks fairly tame, but in a high wind, or with snow, or at ANY time, it can bite you! It's the highest point in Derbyshire, and it has its own mountain rescue team. Please go to the link below to continue. Blogger is a bit restrictive, and only allows so many pics, and I have exceeded it!